The Owensboro came from very humble beginnings and though their success is growing, they have had to work hard to be where they are and continue working to be where they want to be. Courtney started with Ruoff Owensboro in December 2017 and worked remotely and in a temporary office space until July 2018 when the new and current office was complete. Samantha began on the first day of the new office completion. The first week in the new office was full of growing pains for the ladies. AT&T messed up some cords so the phones and internet didn’t work for the first couple of days, and a water main broke in Owensboro so they were without water for three days. The next week branch manager Mark joined the office. 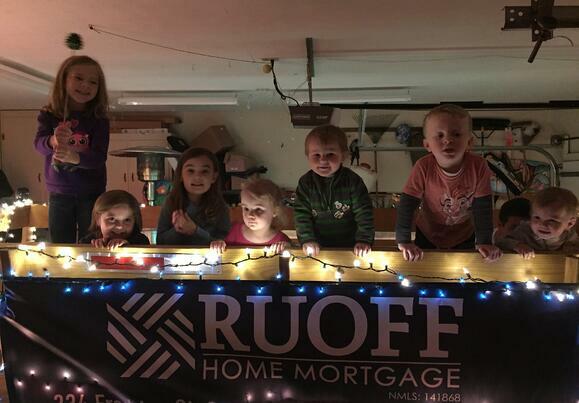 The three spent months going around town to realtor offices, participating in any and all community events, all to build the business and establish roots for Ruoff in Owensboro. In October Peter joined the three. Two months later Aaron came on board. Now they are a strong, solid team of five! With a team philosophy of "Be active, present, and supportive of our community. Establish and nurture relationships to grow as individuals," it is no wonder that they love giving back to their community! Here are a few ways this team is supporting the Owensboro and surrounding areas! In December, the branch kept a Toys for Tots box in their office in December to gather donations. The team filled backpacks one month for Backbacks Of Hope, program that provide backpacks of personal belongings given to children when first entering foster care. 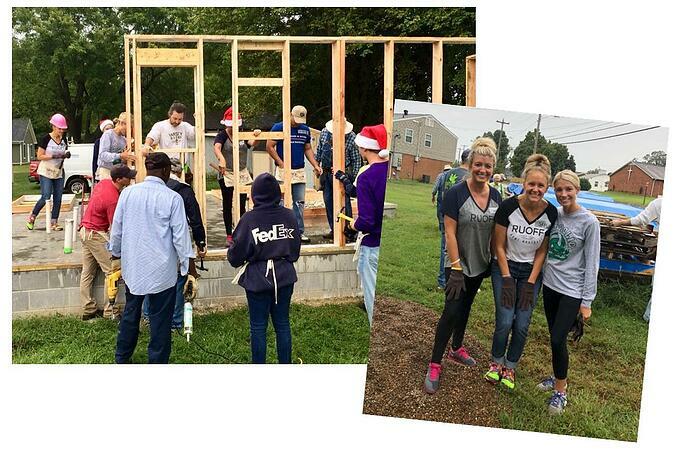 Samantha and Courtney partnered with Habitat for Humanity to help frame a house that a single mom and her children would be moving into. The team volunteered with the Goodfellows Soup Kitchen. They served soup and bused tables and greeted people. Community members came to have lunch for a minimal donation, and all the soups were donated by local restaurants and organizations. 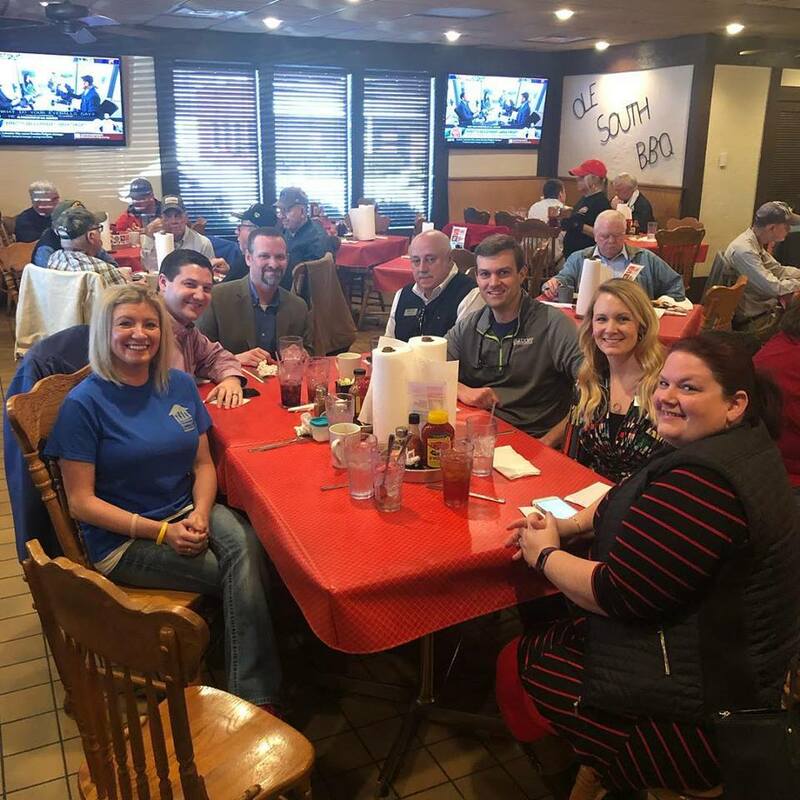 The money raised from the day was donated to Goodfellows, a local organization that provides clothing, shoes, coats, dental care, and Christmas to children of families in need locally. Children are identified through the help of school resources workers. Pete is a Mason and during the holidays he dresses up as Santa for several local organizations and local hospital. They sponsored a hole for a golf tournament benefiting Aid The Homeless, and Samantha and Courtney attended a Throw Back Prom benefiting the same organization. Pete and Mark are involved with Junior Achievement. The team participated in the 82nd Annual Owensboro-Daviess County Christmas Parade, and their kids were on the float! Courtney serves on board of directors for Building Stronger Families and is involved with March of Dimes. What's Coming Up For This Team? We are sponsoring The Friday After 5 Party at the Pier at the Owensboro Convention Center every Friday night the month of July. Friday After 5 began in 1996 with four concerts and grew into a 16-week signature riverfront festival for the entire tri-state area hosting more than 70,000 visitors each season. And for those looking to purchase a new construction home, they have an exclusive offer with a local builder, who builds gorgeous homes, that they are working hard on! With an impressive 70 years of combined experience, this team is perfect partner for your homeownership goals. In fact, they have closed on several loans and their team average is Clear to Close in 10 days or less! 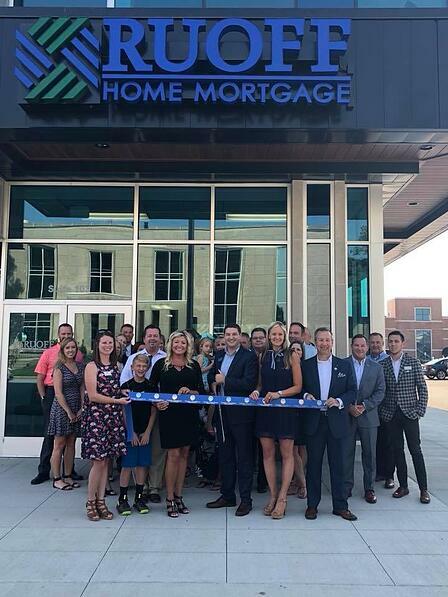 The team is looking to grow a little more as well, so if you are interested in joining this fun group of loan officers, reach out to us today! That's not the only rave review in this area! Here are a couple more! Mark is a Kentucky licensed high school basketball referee. In the 70’s, Pete was a track trainer for the greyhounds at the West Palm Beach Kennel Club and after he first retired. he got a Commercial Driving License, just to keep busy. Pete is full of one liners that keeps the team on their toes, they refer to them as “Pete-isms”. Courtney is a karaoke pro and has a Cavapoo who is quite arguably the cutest dog in the world. Samantha was a paralegal for 13 years before making a career change into the mortgage industry, she was also a “Billboard Model” one time for a jewelry company (and she won’t let anyone forget it). Aaron is an avid golfer and can juggle fire torches (true story!). We have a signature drink called the Ruoff Rumbler (a special concoction of apple cider and Kentucky bourbon), that was born during a golf tournament. If you want to get to know this fun bunch more, visit their Facebook page or stop into their office!